I use this with herbal and decent but not great green teas. Makes them both enjoyable. love the aroma, and the flavor is delightful. good to mix with cheaper or older teas. Gui hua (osmanthus) is a wonderful flower, with a gorgeous overpowering scent from the moment you open the packet, and a rich buttery taste as a beverage. Highly recommended and a really great price. If you´re ever in Hangzhou in spring time, look out for this flower: it literally covers the west lake district and the smell is everywhere. A nice natural sweetener to sweet and polish off rough edges of robust teas. This tea would have been rated excellent not for the sand particles and some dead ants and flies I found in the osmanthus buds while transferring from the packaging to tea containers for storage and while filtering them. Watching the rich golden osmanthus buds floating in the tea liquor while brewing them is a beautiful sight as well. Such a strong fragrance!! Incredibly strong. Warning though: it´s so strong that some of my friends reacted negatively to the aroma, while I personally liked it. The taste is not as overpowering, but is surprisingly milky, and is very unlike other flower teas I´ve tasted. This is the best osmanthus flower (gui hua) i´ve ever seen. bright yellow color with soft fragrant. good quality flowers. as expected. .
Wow, this is so good - Osmanthus Flower. I´ll introduce to my sister who love to add this stuff in her tea also. I don´t have to wait too long for the service with free delivery. I´m happy! Fabulous. Just delicious. Better than I have ever tasted. Nice delivery and well packaged. Good value. The osmanthus flowers are bright yellow and fresh. It has a peachy aroma that isn´t overpowering. Really wonderful. Add to practically anything. The fragrance itself justifies its inclusion in any green and herbal teas. I believe this is the second time I rate the Osmanthus flower. I love it so much. A perfect match with Oolong tea and Pu-erh tea, also it makes my breath smells wonderful. Really Love it! IMO, I think this is better when blended with other oolongs and greens. Still, it´s pretty good and much more fragrant than we expected. These were the most beautiful and fragrant osmanthus flowers I have ever seen. Having ordered teas that contain them (from another company) I had nothing to compare them to. The flowers have a beautiful yellow color and the aroma is amazing. I put half my order (about 1 oz.) into 3 oz of rooibos tea and the other half into about the same quantity of jasmine pearls. It is really fun to mix your own teas! Also, the price of the osmanthus is outstanding. It´s a real bargain. Best quality osmanthus . Beautiful flowers, very fragrant and bright yellow in color. I´m so glad I ordered from Teaspring.com. Fast shipping too straight from Hong Kong, China. Thank you so much. I´m enjoying this tea. I´d previously had a low-oxidation oolong blended with osmanthus that was quite good, so I thought I would try this one. The price makes it quite accessible. Overall, the scent was a unique floral/fruit mixture, with the taste in the sweeter part of the spectrum. It had a wonderful aftertaste. It´s probably more useful to use it as a blend, but it also drinks well straight. We received the product and we are using it. We may order more. Very nice sweet peachy flavor. I drink it pure and sometimes mix it with some oolongs and green teas i find a bit bitter. excellent quality of osmanthus flowers. not to drink as plain tea but can be used to flavor other green tea. Il toccasana per la sera; non ptrei più farne a meno. La soluzione ideale per aiutare la digestione quando è troppo tardi per il tea. A very sweet and peachy taste. Beautiful little flowers that are an enjoiment to watch floating around in the teapot. Goes brilliantly with green and black tea. Very nice in fragrant, sweet and has a nice yellow colour when brew! As always osmanthus flower are just gorgeous. Just combine them with other teas for that special scent. A very lovely sweet drink. The wonderful sweet fragrance reminds me of peaches. I´m going to drink it alone when I need something sweet, and I´m going to mix it with teas. Definitely going to order it again. very fregrant! even very good with roobios tea. it has very strong fregrant, so i just use very little at a time. Little bag of this flower can last a long time. it smells good. I like it very much. very good seasoning to make chinese traditional dessert. Great scent of small yellow flowers! Love it in mixture with other teas no matter what kind. Una vera sorpresa. ottimo e piacevole rimedio per facilitare la digestione. Un buona alternativa al tea per la sera perché privo dei caffeina. Unic flavour and extraordinary beutiful sweet micro yellow flowers, I add a teaspooon of this in green tea, try will surprised. The quality is good. I just expect the fragrance would be a bit stronger. I love this Osmanthus tea; it is unbelievably yummy but also magic: it fixes stomach and period aches instantly! Also, Tea Spring seems to be the only place out of Asia where you can buy it unmixed. Regarding the buying experience, it couldn´t be better: packaging is perfect, prices are reasonable, timing is just great and service is personal and caring. Thanks so very much, Daniel! The flower is fragrant and tastes great. It makes a great complement to any existing green tea. However, use sparingly in your tea as the flavor of the flower can be overpowering. I love this stuff ! I use it to boost the floral essence of an oolong tea. just a little bit goes a long way ! I bought this as a gift to a friend. Very good product, smell like a fresh kimokusei flowers. Very sweet, very strong, but delicious. Makes a nice yellow cup of unique brew. I can’t find this kind of dried flower at chinese grocery store. Very nice quality. I didn’t expect that the scent is almost as strong as the fresh kimokusei flower. I use it in combination with other green tea, and satisfied! This is a good quality osmanthus flower - I add it too lower quality oolong teas to enhance it’s flavor. 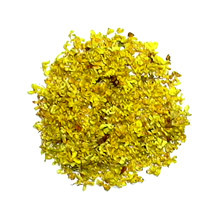 The dried osmanthus flower carries a very naturally sweet scent, added to the Dong Ding Oolong tea, it creates my favorite tea by far. Just lovely! HIGHLY recommended as a blend, which we add to China black tea, or enjoy it as a tea simply by itself. The aroma is absolutely divine with a very smooth flavor that makes every tea experience truly a luxury to savor as long as possible. Good quality - fresh, fragrant, delightfull. Trully tropical treat not only for drinking - great for creating atmosphere during tea drinking, if you don’t want use incenses. I get the Osmanthus from teaspring yesteday. I opened it right after I get it, such a good smell. This is the best Osmanthus Flower tea I have even seen for the last few years. I mixed it together with my green tea, the taste is great, it is sweet and aromatic. I like this Osmanthus very much. And I think I will continue to order more it in the future. This is actually not a tea. But it has a very strong and special taste for people who like it. And the quality of the flowers seems to be very good. I mixed this with some Keemun for the morning. Delicious. SOOO soothing. Very good mixed with rose. sweet taste and smell very good. I came back order some more for friends. I enjoied it very much. Very good. A very interesting flavor. I like to add a teaspoon of it to the blend of tea I put in my iced tea machine. Wow...the fruitiest smell and taste possible. Great for blending if that is your thing. Nice but powerful. Sweet aroma and natural taste ! Can blend with green tea to add the floral aroma.